EIA projects that the United States will become a net energy exporter in 2022 in the newly released Annual Energy Outlook 2018 (AEO2018) Reference case, primarily driven by changes in petroleum and natural gas markets. The transition from net energy importer to net energy exporter occurs even earlier in some sensitivity cases that modify assumptions about oil prices or resource extraction. Sensitivity cases with less energy production project that the United States will remain a net energy importer through 2050. The transition of the United States to a net energy exporter is fastest in the High Oil Price case, where higher crude oil prices lead to more oil and natural gas production and transition the United States into a net exporter by 2020. In that case, higher crude oil prices also result in higher petroleum product prices and lower consumption of petroleum products, driving decreases in net petroleum imports. In the High Oil and Gas Resource and Technology case, with more favorable assumptions for geology and technological developments, the United States becomes a net exporter in 2020, and net exports increase through the end of the projection period. 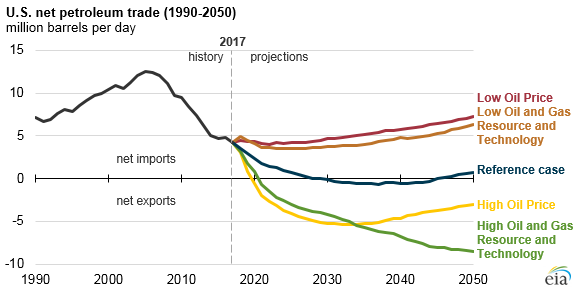 In cases with relatively low oil prices or less favorable assumptions for geology and technological developments, U.S. net energy trade still decreases, but the United States remains a net energy importer through 2050. In energy equivalent terms, the United States imported about 27 quadrillion British thermal units (quads) of energy in 2017 and exported 18 quads, which resulted in 9 quads of net imports. In 2017, the United States imported about 11 quads of petroleum and other liquids and exported 2 quads of coal and coal coke. U.S. natural gas trade in 2017 was nearly balanced between imports and exports, and net electricity trade with Canada and Mexico was relatively small. Petroleum and natural gas account for most of the changes EIA projects in U.S. energy trade. Note: Petroleum net imports include crude oil, petroleum products, and natural gas plant liquids (NGPLs). U.S. net petroleum trade—crude oil, petroleum products, and natural gas plant liquids—has fallen in recent years, reaching 3.8 million barrels per day (b/d) in 2017 based on data through November. 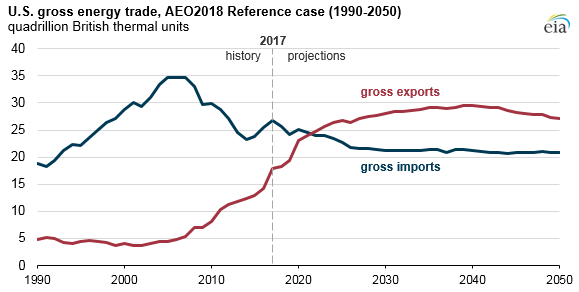 In the AEO2018 Reference case, petroleum net imports are projected to decrease through 2035, as increasing production and decreasing domestic demand result in lower petroleum imports and more exports. Net petroleum imports vary significantly across price and resource cases as domestic crude oil production shifts. By 2030, net petroleum trade ranges from exporting 5.3 million b/d in the High Oil Price case to importing 4.6 million b/d in the Low Oil Price case. Net petroleum exports in the High Oil and Gas Resource and Technology case grow throughout the projection period, ultimately reaching 8.5 million b/d by 2050. The United States transitioned to a net exporter of natural gas in 2017, and all cases in the AEO2018 project the United States remains a net exporter of natural gas. Most of the differences between cases can be attributed to differences in projections for liquefied natural gas (LNG) trade as opposed to pipeline shipments of natural gas. As LNG export facilities that are currently under construction are completed, LNG exports are projected to increase, especially to countries in Asia. After near-term increases in LNG exports, U.S. natural gas export growth is projected to slow as U.S.-sourced LNG becomes less competitive in world markets. In the Reference case, net natural gas exports reach a high of 23 billion cubic feet per day (Bcf/d) in 2050. In the High Oil Price case, net natural gas exports reach a high of 37.4 Bcf/d by 2050. In the Low Oil and Gas Resource and Technology case, net natural gas exports begin to decrease in the mid-2020s, reaching 6.7 Bcf/d by 2050.